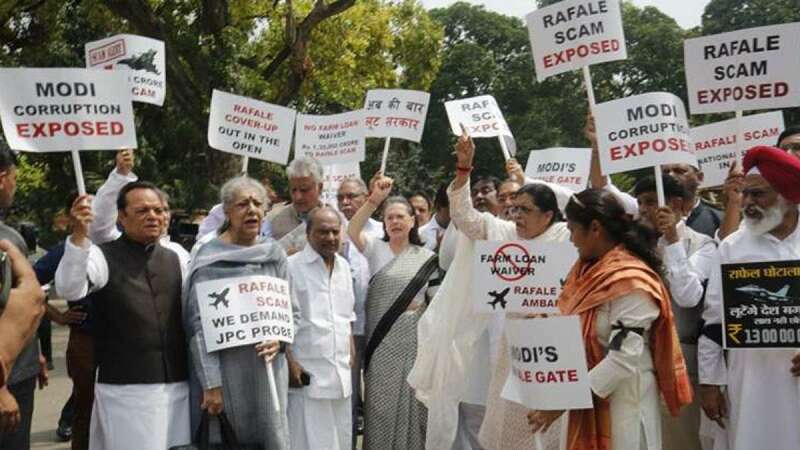 New Delhi : On the last day of Parliament's monsoon session, UPA Chairperson and Congress leader Sonia Gandhi on Friday led her party MPs in protest against the Modi government over the controversial Rafale deal India has signed with France to buy fighter jets. The placards read "Modi corruption exposed", "Rafale cover-up out in the open", "Rafale scam: we demand JPC probe", Modi's Rafale gate" and "No farm loan waiver -- Rs 130,000 crore to Rafale scam". "This is the biggest scam of the world. We demabd the formation of a Joint Parliamentary Committee to investigate the Rafale deal," Azad said in the Rajya Sabha. Congress MPs had earlier boycotted a breakfast meeting by Vice President and Rajya Sabha chairman Venkaiah Naidu in protest against the government's move to pass three bills in the House without any discussion.